This uniquely contoured form of steel and foam is an exercise device that helps eliminate shoulder pain and weakness. The ShoulderHorn fits closely and comfortable to your body, and secures your arms in the optimum position for isolating and strengthening the muscles of the rotator cuff. One simple exercise, performed just twice per week with the ShoulderHorn can help make your shoulders stronger and pain free. Don't let the simplicity and low cost of this product fool you. It's one of the single most effective ways to strengthen your rotator cuff, and is especially valuable for bodybuilders and athletes involved in throwing sports, such as baseball. There are weight machines that can be used for rotator cuff training, but most are very expensive, and few gyms have them. The ShoulderHorn outperforms those machines, because it automatically locks your arms into the most effective position for rotator cuff training (partially abducted and in line with the scapular plane). Regular use of this product will make your shoulders less prone to injury, and can boost your strength in the bench press and many other upper body exercises. The ShoulderHorn is used with a pair of hand-held weights to perform the external rotation exercise shown on the right. Beginners will use as little as 2 lbs of weight for this exercise, and even the strongest athletes will need less than 20 lbs. For this reason, a small medicine ball, or even a can of soup, will provide suitable resistance if dumbbells aren't available. A training booklet, included with the ShoulderHorn, provides additional details on how to benefit most from this product. 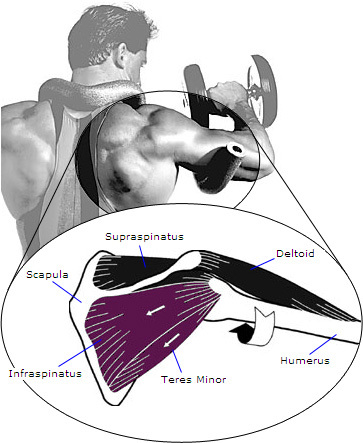 Two of the most underrated muscles of the body are the infraspinatus and the teres minor. These small muscles of the rotator cuff stretch from your shoulder blade to your upper arm. They work together to externally rotate your arm, and to stabilize your arm during almost all shoulder movements. If these two muscles are weak or underdeveloped in comparison to your major chest (pectoralis major) and back (latisimus dorsi) muscles, a muscular imbalance is created that can severely jeopardize your shoulder's integrity, and lead to chronic pain and injury. The ShoulderHorn helps restore your shoulder's natural strength balance by specifically strengthening and conditioning these two key muscles. Bench pressing a weight, throwing a baseball, and serving a volleyball are just a few of the many activities that overdevelop your internal rotators in relation to your external rotators. By isolating and strengthening your external rotators with the ShoulderHorn, you can eliminate this muscular imbalance and restore proper function of the shoulder. For heights up to 5'6" and weights up to 150 lbs. For heights up to 5'10" and weights up to 190 lbs. For heights over 5'10" and weights over 190 lbs. This product line is made in the USA, and carries STI's Complete Satisfaction Guarantee. Try it in your own home for 90 days. If you are dissatisfied for any reason, simply return the product to STI, and you'll receive a prompt refund of its full purchase price (excluding the original shipping and handling charges). This product is manufactured or distributed by STI, and is available at discounted pricing to qualified retailers. STI can also drop ship this product directly to your customers. If you would like to sell this product, please contact to determine your company's eligibility, pricing, and minimum order requirements. "Great reduction in pain. Almost completely stable, pain-free weight lifting." "More of a pain free range of motion. I'm not being awakened at night by pain." "I am finally benching with total confidence, and my weights have increased steadily... an excellent product." "Bench (315 to 365). Also more stable and less vibrations during lift along with less pain. Painful 'clicking' noises have almost disappeared on all upper body movements. All in only 5 weeks of use!" "I've increased my weight in bench, flyes, and shoulder press with less pain. I also threw 80 pitches at batting practice (after 5 months of not playing ball) with greater velocity and no pain at all."